As I write I’m preparing for Glastonbury 2014. This will be my twelfth time at the most famous music festival in the world. As a 19-year-old student in 1993, bumbling along to something I’d barely heard of with a ticket I’d bought the week before, I had no idea what I was getting myself into. There are literally hundreds of stages and thousands of acts: as well as the main stages showing music, there’s a circus, a theatre, poetry, cabaret, comedy… everything. It was exhausting and exhilarating. By 2002, I was attending the festival every year, watching bands like Coldplay, R.E.M., Radiohead, Muse and Paul McCartney, but above all just enjoying the place itself. It’s magical. Then, in 2005, my world changed forever when I woke up one summer morning with a numbness in my right hand that spread slowly around my body: it was the first, insidious symptom of multiple sclerosis. Life went on, and I can track the four years before my eventual diagnosis through the bands I saw at the festival that I continued to attend: the White Stripes, the Killers, the Arctic Monkeys. By the time I watched Neil Young, Bruce Springsteen and Blur play at the 2009 Festival, I had a diagnosis and begun weekly injections of Avonex. Glastonbury is huge, exhausting and sometimes overwhelming; simply walking around takes enormous amounts of energy, especially when it’s muddy. I need to watch my footing in the crowds and I have to think carefully about how much energy I’m using. Am I drinking enough water? Am I drinking too much cider? Should I sit down? Do I need to go back to the tent for a nap? Do I need to do all of these things because I have MS? Perhaps… but I’m not 19 any more and every sensible person at the festival is asking themselves the same questions. Have I let MS stop me enjoying U2 or The Rolling Stones at the festival I love? Will I let it stop me watching Metallica this year? Hell no! I just prioritise. You can’t see everything; no one can. 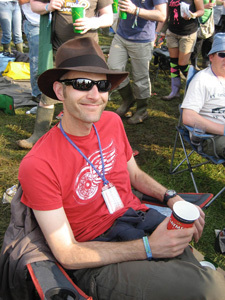 In fact, MS or not, I do Glastonbury much better now than I did back in 1993. I wouldn’t be missing the Velvet Underground, for starters.